Light Work‘s lab and community spaces serve as a home base for many graduate and undergraduate students at Syracuse University. With this series of blog installments, we wanted to showcase the work of a few of these recent graduates who have actively used our spaces in the creation of their thesis projects. Today, we interview Sarah Pfohl, whose work you can find here. LW: Where did you grow up? How does that affect your work? I’m from rural Central New York State, about an hour south of Syracuse. To be more precise: The place where I grew up, defined by experience rather than a map, covers 3 counties, parts of 2 telephone area codes, and 7 distinct villages, none with a population of more than 2,000 individuals. Together, these places cover around 35 square miles of Central New York State. Populated by approximately 4,000 people, the place I define as coming from consists of a land mass 7 times larger than New York City. I am from a hill where my family has lived since 1960. My maternal great aunt and uncle lived next door on one side, my paternal grandmother and aunt lived on the opposite side. I lived here until I was 18. For my thesis work at SU, I photographed my mother here, in the place where we both grew up. LW: What are you focusing on in your current work? Right now, I’m focused on learning more about how to make landscape and portrait photographs and want to use these skills to make a body of work that foregrounds the close, intimate relationship my mother has with the land and plants she knows very well. As I move forward with the project, I want to bring together a group of photographs of a single person in a particular place that in foregrounding this interrelationship, address issues surrounding rural representation and land use in rural spaces. LW: What do you consider a successful photograph? I want surprise, but the location of the shift in perception that I look for can happen in a bunch of different places (the way the subject matter is represented in the image, the installation/contextualization of the image/s, the conceptual framework that informs the work) and be rich and engaging. The intimate relationship my mother has to the place where we both grew up, that I try to make visible through the photographs, is present in the lives of all people, through their reliance on the natural resources housed, cultivated, and stewarded in rural places. I titled my thesis show The forest rests also in you to underscore this fact. I wanted to include a feature in the work that asked that the audience to consider their own relationship to wild spaces through a set of photographs of plants and my mother. I used the title to do this. LW: What artists are you looking at right now? 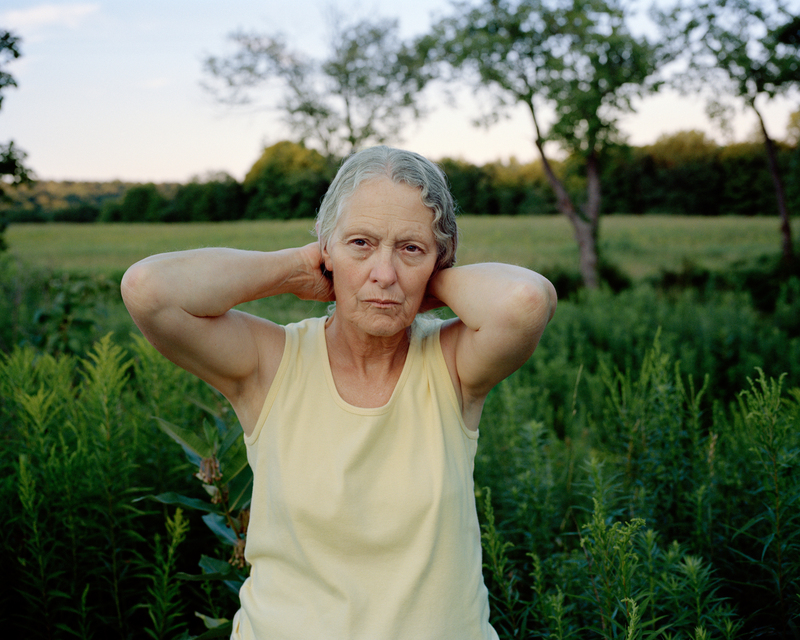 Susan Worsham, Sally Mann, Viviane Sassen, Carrie Mae Weems, Roni Horn, and Emmet Gowin. TIANXIN (Sophie Chen), Peter Puklus, Jay Muhlin, and Bryan Graf. John Chervinsky, Zeke Berman, and Jan Groover. I read a lot of Wendell Berry. LW: How has your work shifted in your time at SU? I came to SU from a formal education and professional background outside art photography (in drawing, art history, and education). Technically, I’ve gotten more precise. I learned how to pay better attention to light and the frame. LW: How did you find Light Work? In 2007 I was living in Central New York and needed to learn how to use my new digital camera. A friend recommended I check out Light Work/Community Darkroom’s workshops and I found a workshop that helped me. LW: What resources or artists have you connected to there? I got to meet and have reviews with Susan Worsham and Aspen Mayes. In terms of resources: Big printers, calibrated monitors, a great library of photobooks and magazines, John Mannion’s keen eye and patience for helping me make my prints better. I also love going to Light Work because I always run into people there that care about photography and a number of great unanticipated conversations have emerged from these informal meetings. LW: Graduate School creates a space both for education and for artmaking. How have both of those spaces informed each other? I was able to use my coursework requirements at SU to take classes that helped me think more critically, effectively, and deeply about ideas I wanted to engage through photography. LW: What are your plans after graduating? Making pictures and reading! I’m working on a new photography project called Clepsydra (about water and time) and will continue to photograph for the project that became my thesis here at SU. I just accepted a position teaching art education at Central Michigan University for the 2014-2015 academic year and am very excited that I am going to be able to continue teaching in higher education. Also, my partner and I are co-curating the next issue of Oranbeg NET together, hosted online by Oranbeg Press.